While I am busy making Christmas crafts for our upcoming craft show, I thought it would be fun to feature a Christmas craft that everyone can do. 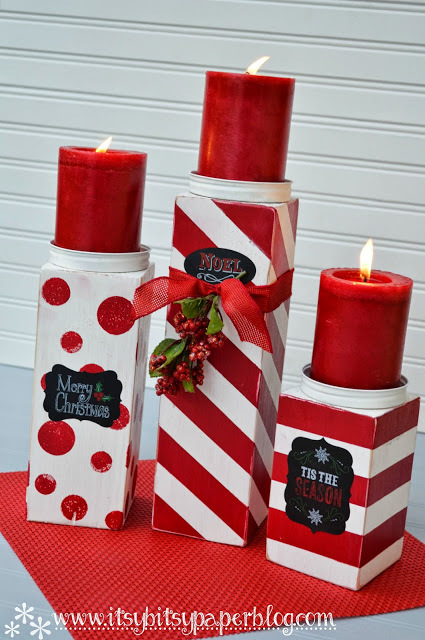 The Itsy Bitsy Paper Blog shared how to make these candlesticks made from wood 4 X4s. She also shares how she made them with her friends at a painting party in her home. Everyone had a great time, and got to take home their candlesticks. Be sure to stop over to The Itsy Bitsy Paper Blog to see how to make the candlesticks, and more details about the party. Thank you so much Lindy for linking up your great idea to Dare to Share! Wow thank you so much for featuring my project. The party was so much fun and the candlesticks are my new favorite decoration for Christmas. I appreciate you sharing them. Thanks again. You are very welcome Lindy! I think they are so pretty!